February 9, 2018: the below story had a happy ending: Mario Bartoli found the recipient of the his son’s gift of life. Twenty years after his son’s death, Christian’s father Mario is searching for the person who received his heart as a transplant. January 19th marked the 20th anniversary since Livorno resident Christian Bartoli passed away from an aneurysm at a mere 17 years old. 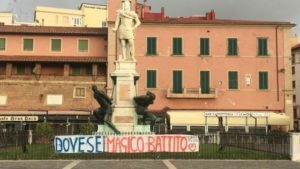 Sixty-two year old Mario Bartoli has covered the city with banners that read, “Where are you, magic heart (magico battito)?” They can be found in front of the Quattro Mori, the Gazebo della Terrazza, the cemetery of Lupi, and Piazza Christian Bartoli. By law, doctors are unable to provide Mario with contact information of the person who received his son’s heart. Led by love and longing to once again feel the “magic heartbeat,” Mario Bartoli hopes to be united with the person who carries on his son’s legacy.